Original owner: Honl. Peter Smith of Waterloo Erected: 1870 One of the first cottages built in Mount Tabor, it was described as plain but comfortable. In the mid-1870s it was remodeled into a very neat and cozy cottage and architectural adornments (gingerbread vergeboards and balustrades) were added. Note the sawn vergeboard under the gable. 27 Trinity Place Original owner: Rev. C.S. 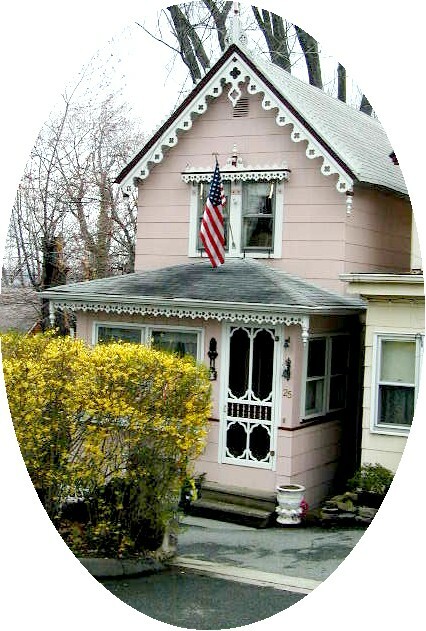 Coit of Jersey City Erected: early 1870s In 1903 the front porch of this cottage was enlarged and an addition put on the rear. Note the Italianate canopy over the door to what was originally an upper porch, and the charming cupola.